In the first part of our three part series about delays in receiving a donor’s testing result (collection site, labs, MROs), we discussed delays at a collection site. To help you understand the testing process better, we are continuing this series with where delays can happen during the testing process at the laboratory. Laboratories receive thousands of specimens each night from couriers and shipping companies like FedEx. Each specimen is then entered into the system and placed into a batch. Lab technicians review all chain of custody forms to make sure each chain does not have missing information. When it is determined that a chain isn’t complete, the lab then determines whether the flaw is correctable or fatal. If one of the seven fatal flaws are committed, the test is canceled and reported to the MRO as a fatal flaw. One example of a fatal flaw is when the collector does not print their name and sign the chain. In the case of a correctable flaw, the lab sends a memorandum of record (or affidavit) to the collector to be completed and sent back to the lab. An example of a correctable flaw is when a lab is waiting for a wet signature on the chain of custody form. The lab cannot proceed with testing the sample until they receive the completed memorandum, which delays the overall resulting times. Once all the correct records and signatures are received, the specimen then goes through an initial base screen test. If the results of this screening is negative, no further testing is needed and the negative result will be reported quickly. However, if there is any trace of drugs in that initial screen’s sample, the sample is then GCMS testing (Gas Chromatography – Mass Spectrometry). Sometimes this test doesn’t even produce affirmative negative or positive result of the sample. If it does, the results are reported. If not, the urine sample is broken down even more and sent back through the GCMS test again, and this process is repeated until an affirmative negative, positive, negative-dilute, or positive-dilute result is given. Each round of GCMS testing is a batch of other specimens and each batch only gets ran once per 24 hours. So if the specimen is going through multiple rounds of urine breakdown and GCMS batch testing, the results will be unavoidably delayed and there is nothing anyone can do to prevent this delay from happening. If no true result is affirmed in this GCMS process, the test must be canceled. Once canceled, the MRO can direct a retest (especially if a negative result is needed for a pre-employment drug test in the hiring process) or cancel a retest because no cheating was found or it’s too late to get a result after a reasonable suspicion or post-accident drug test. So what’s the point of telling you all of this? At CleanFleet, we realize that getting results back in a timely manner is important to you and your business. With this article, we wanted to help you understand the process of getting an accurate result from the lab and where delays may happen. In order to keep you informed on where results are, our staff is in constant contact with the lab every day in order to get results reported to an MRO as quickly as possible. As a TPA/Consortium, this is all we can do within the testing process to get results back to the donor and their company as quickly as possible. Is your TPA/Consortium best-in-class? Looking to switch to a trust-worthy and educated TPA/Consortium? Look no further than CleanFleet. Learn more about joining our consortium membership by clicking here today. There are 0 comment. 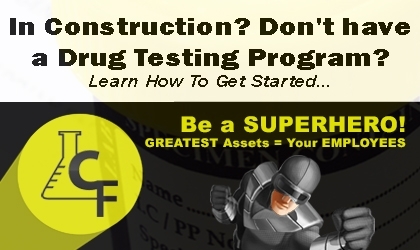 on "The Lab’s Drug Testing Process and How It Affects Result Times"
Over 65 percent of all accidents on the job are related to misuse of drugs or alcohol.